Stars & Stripes 1 Feather Flag 12'x26"
Stars & Stripes 2 Feather Flag 12'x26"
Blue/White Diagonal Stripes Feather Flag 12'x26"
Rainbow 1 Feather Flag 12'x26"
Bright Stripes 2 Feather Flag 12'x26"
Black/White Checkered Feather Flag 12'x26"
Feather flag banners are great for businesses, schools and events. Used alone or together they can create a striking display that will catch the attention of anyone driving or walking by. 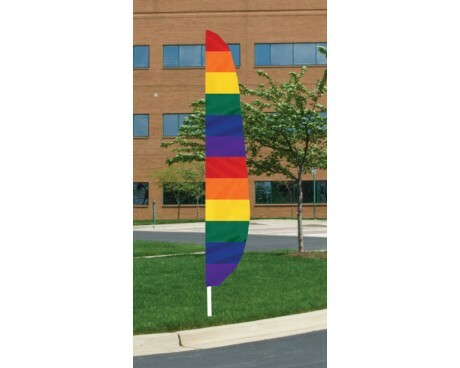 Customize the look of your store front with printed or blank feather flags to make your business stand out. Need a pop of color for a seasonal promotion? 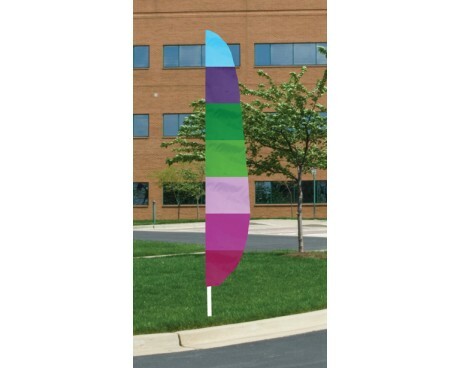 Feather flags are an effective and temporary solution for promotions and sales. Planning a festival or fair? 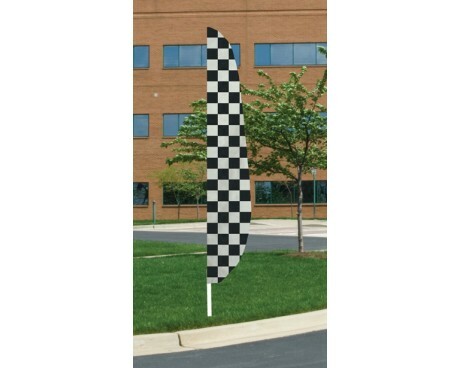 Feather flags lining the street will help your visitors find their turn and have them excited before they reach the gate. Call for price breaks on large orders. 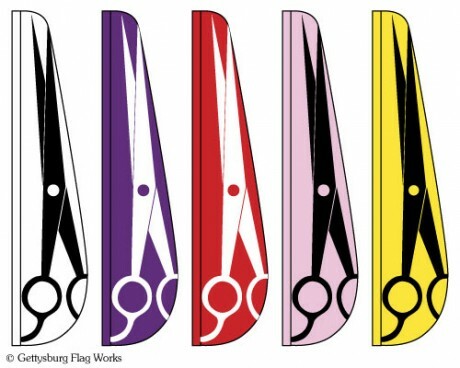 Display feather flags with other shapes of blank flags for an even more eye catching look! Schools and sports teams use feather flag banners to create excitement and to decorate with team colors. 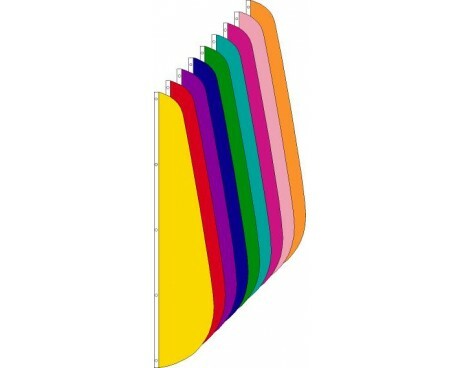 Brighten up the stadium or game field with temporary feather flags that also instill school pride. Have couple printed with the mascot or logo for an added benefit. Sleeved feather flags are made to mount on an adjustable telescoping poles like our Superflex® pole. The sleeve is 3" wide when laid flat and is sewn closed at the top to keep it at the top of the flagpole. 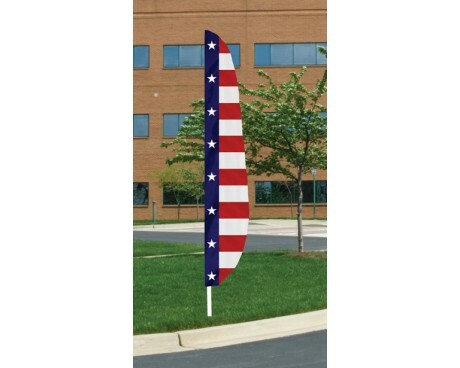 Header & grommet feather flags mount with clips to a standard flagpole halyard and can be raised and lowered like a traditional flag. 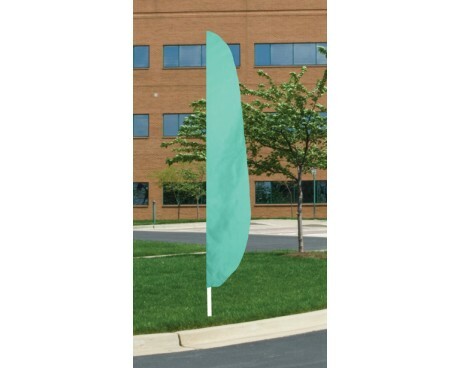 Feather flags are usually made in a single-sided style to keep them light weight. 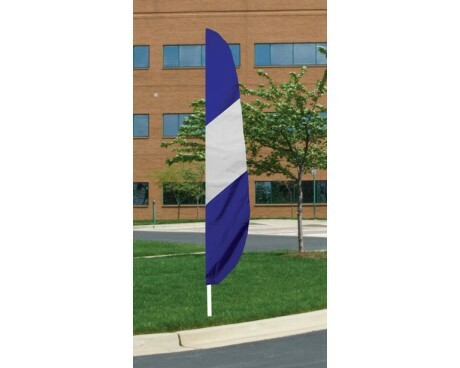 A double-sided flag will be too heavy to fly in a light wind and will therefore, be less effective as a marketing tool. 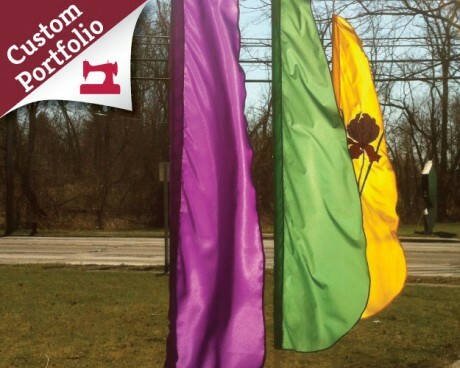 Our solid colored feather flag banners are a beautiful accent to your store front or driveway. They are available in a wide variety of nylon colors, several sizes and with either grommets or a sleeve for mounting. Mix and match with patterned or custom feather flags for a custom look on a budget. 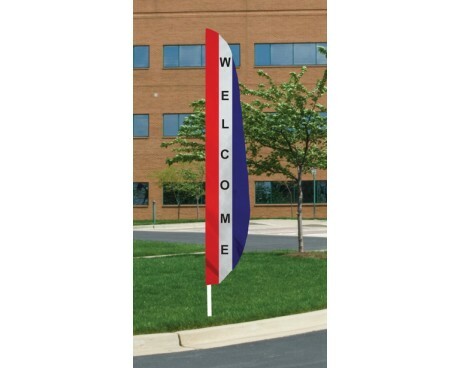 Message feather flags like "open" or "welcome" are available in several of our most popular color combinations for every-day or holiday decorating. Create an inviting message to your customers before they even come to the door. 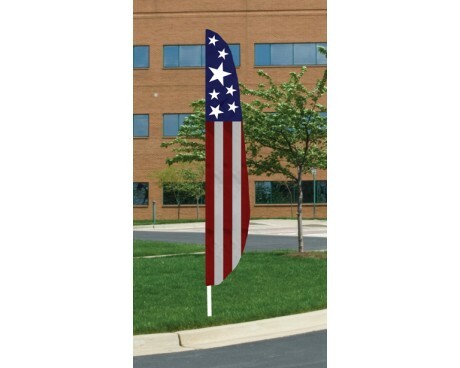 Patterned feather flags like our patriotic stars and stripes or the black and white checkered pattern help to catch potential customers when they are driving past your business. Decorate for Independence Day, Memorial Day or Veterans Day with our Red, White and Blue Americana designs.